Plot: In a cyber-heavy future Harrison Ford stars as a futuristic police man hired to kill renegade clones. "I've seen things you people wouldn't believe. Attack ships on fire off the shoulder of Orion. I watched C-beams glitter in the dark near the Tannh�user Gate. All those moments will be lost in time, like tears...in...rain. Time to die." One of my all time favourite scenes from any movie ever. I've watched the "Tears in Rain" monologue about a billion times by now. It's a scene where Rick Deckard (Harrison Ford) leans humanity from someone who isn't human. Rutger Hauer, I love you man. (Basing my review off of the original theatrical cut) An intelligent genre mix of the 'narrating detective' noir and grand SFX sci-fi. This is a visual marvel! The effects, costume, and set design, are still enthralling in today's CG heavy cinema. The story has a dark and mysterious tone that pulls you into it's bizarrely believable world. Like all great sci-fi, the film asks some big or moral questions. Those seem to only be hinted at and not as prevalent to the characters or plot, which gets action heavy in the latter half. I feel those ideas will probably be explored more in the other various 'cuts' of the film. The original version, as it stands, is a great piece of entertainment worth revisiting. This one is a sci-fi classic! Any sci-fi fan has to see / know this movie. 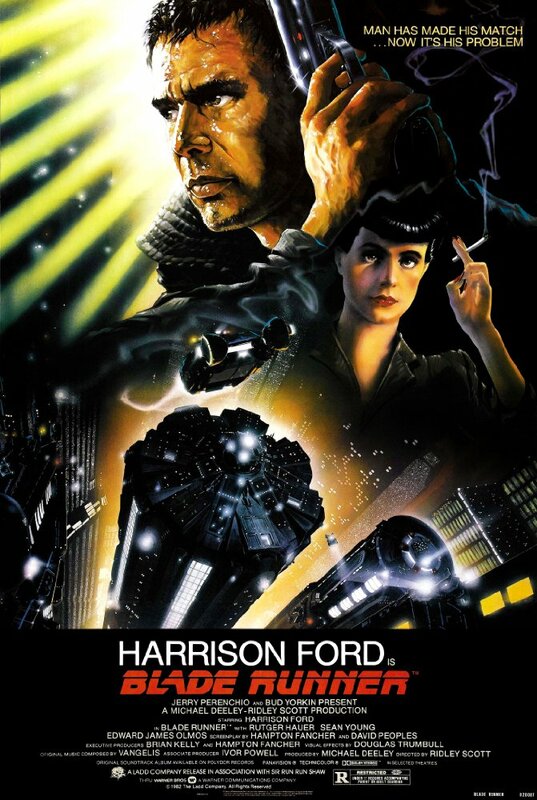 Blade Runner has a brilliantly intense and controversial subject matter. Dystopian and utopic, totalitarian futuristic cities is a concept that has been treated several times since we have memory, but this is one of the first American films that dares to take that vision one step forward, adapting it to the pop-culture necessities of the time. - The weakness of the human condition. - The search for a reason of human existence. - The fear of lacking the ability to comprehend what doesn't belong to our race. - Mankind's total subordination and dependence towards technology. - An overall depressing and dark atmosphere (mood) and desolate way of life. - Lack of nature and beauty. No posts have been made on this movie yet. Be the first to start talking about Blade Runner!